Three participants of the meeting condemned the breach of ceasefire by militants. 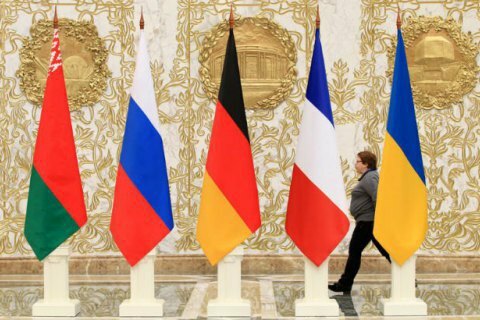 The diplomatic advisors to the leaders of Ukraine, Germany and France at a meeting in Minsk on 7 April condemned the violation of the ceasefire deal by militants in Donbas, which has been agreed upon by the Tripartite Contact Group. "The Ukrainian, German and French parties decried violation of ceasefire regime, introduced on April 1, 2017 pursuant to the decision of the Trilateral Contact Group of March 29, 2017, by Russia-backed militants," the administration of the Ukrainian president said in a release. The parties advocated the immediate consolidation of the "ceasefire". They also discussed the implementation of agreements on the pull-out heavy weapons, the provision of safe conditions for OSCE monitors and the enduring their unhindered access to all the occupied territories. "The Russian side was urged to take every necessary effort to prevent militants from intimidating the Mission’s observers. It was underscored that the SMM must have every opportunity to fulfill its mandate completely," the release says. Ukraine, Germany and France called on Russia to unblock the release of hostages in Donbas, in particular, on the eve of the Easter holidays. "The parties agreed to continue intensive contacts within the Normandy format with a view to harmonize the roadmap of implementation of the Minsk agreements," the release said. Earlier, President Petro Poroshenko acknowledged the failure of the April ceasefire.